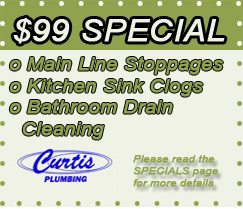 Curtis Plumbing has been in business for over 75 years fixing everything from kitchen sinks to sewage line stoppages. There are no drain cleanings or stoppages too large or difficult for Curtis Plumbing Services. There will be other companies that will advertise drain cleaning for less than Curtis Plumbing, which should be a red flag; there may be a catch with their services. If you come across this issue, ask if that drain cleaner company is licensed and if they have business insurance. Also ask, how many years they have been in business and if they are using the safest and most up to date methods. If Curtis Plumbing Services can’t clear your Back-Up or Clog, the service will be free of charge. We stand by our 100% Satisfaction Guaranteed policy and if you are not completely satisfied with our installation or repair, we will perform the job again to your satisfaction for free. Please note that there is no “House Call” fee on clogs, so this applies to plumbing calls only. In the event of a delay on a stoppage call, please ask for a free “House Call Certificate” for any future plumbing needs. No “House Call” fees for Clogs. Applies only to residential stoppages. Clogs must be repaired through the cabling method and does not include jetting or other more technical methods. Clogs or blockages must be within reasonable access; we cannot place our plumbers in dangerous positions. We do not go through roof vents, as it is a great way to cause roof leaks, while also being an ineffective method of clearing stopped drains. * Additional charges apply if corrosive chemicals were used in the sewage line. Cables should never go through a smaller pipe to clear a pipe of larger diameter, as this is an exceptional way to get the cable caught in the drain line. Drain vents use non-directional fittings which are very different than actual drain lines, and often results in trapped cables. The vents are usually too far from the stoppage and working through too many turns reduces the strength of the cable to effectively clear the blockage. It is an unnecessarily hazardous procedure and we wish to prevent anybody from getting injured. In the event of a delay on a plumbing call, please ask for a free “House Call Certificate.” We do not clean main drains or sewers through an interior cleanout, as opening an inside cleanout while the drain is backed up will cause sewage to run out into your inside living space. We also do not remove toilets to gain access to clear a main drain or sewer. One thing you absolutely do not want in your living space is a drain cleaning machine and cable, where the cable was just recently pulled out of somebody else’s sewer. All readily accessible sewer or main drain cleanout must be 3″ or larger, with a plug or cover joined to an opening in the pipe, which can be removed for the purpose of cleaning or examining the interior of the pipe. Some cleanouts, such as under the house, are not considered accessible. If we cannot clear your blockage by the cabling method, we will not charge you for the service. If you are not completely satisfied with our installation or repair service, we will do the job again until we reach your total satisfaction. Our service is guaranteed! Curtis Plumbing does not provide services for: Area Drains, Patio Drains, Deck Drains, Pool Drains, Roof Drains, Yard Drains and Rain Gutters.